Tippah Amateur Radio Association (TARA) is an affiliated member club of the American Radio Relay League (ARRL) and is assigned the FCC club callsign K5DGL with K5YPV the license trustee. MEETING TIME:The Tippah Amateur Radio Association meets on an as-needed basis. The meetings are held at the Tippah County Emergency Operations Center (EOC). The EOC is located on the grounds of the Tippah County Hospital, directly across the "side" street from Stone's Jewelry, all at the intersection of Highway 15 North and North Main Street. The TARA maintains the HF and VHF antenna systems at the EOC as part of the organization's commitment to emergency communications preparedness. 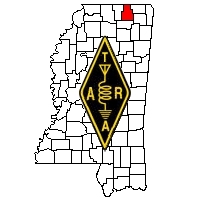 MEMBERSHIP: Full (voting) membership in TARA is open to any licensed Amateur Radio Operator in the Ripley/Tippah County/North Mississippi area. Associate membership is open to anyone with a genuine interest in Amateur Radio. Officers must be residents of Tippah County, but all are welcome to attend our meetings. AFFILIATION: The Tippah Amateur Radio Association is an affiliated organization of The American Radio Relay League. The ARRL is the national organization of Ham Radio Operators, and as such, League membership is strongly recommended, particularly since affiliation requires that 51% or more of our members are also League members. For more information on the ARRL, and on Ham Radio in general, go to their website at http://www.arrl.org. REPEATER: The TARA supports the Pine Grove Repeater (a privately owned system), and recommends all local amateurs have the capability of operation on this system. The repeater is located near the ETV tower just East of Pine Grove, MS near the Tippah/Prentiss County line. The system includes remote voter receivers located around the area, and is an "open" system. The frequency split is 144.59/145.19 with a tone of 110.9Hz. While construction is ongoing, the repeater is currently up for operation and testing. Once testing is complete, and we have all the gear mounted, the remote receivers will be located in Tupelo (at the Hospital), New Albany, Falkner, Corinth, Pontotoc, Belmont and Booneville. A STORM-READY COMMUNITY: Thanks to work from Amy, N5TBB and Tom, KD5SBC, Ripley has been awarded status as a "Storm Ready Community" by the National Weather Service. The standards were specific and rigorous, and Ripley is one of the first in the Mid-South to be awarded this status. Congrats! Would you like to make a difference in the world? ....... Have you been searching for a way to do that? ....... Your Amateur Radio License can help you to accomplish that goal. TARA is known to several agencies that are interested in having amateur radio support during emergency situations. These agencies are impressed by the group's training and ability to get messages through when normal communications fail. TARA is interested in expanding to serve these agencies more efficiently. We would like to extend an invitation for you to expand with us. Don't have your Amateur Radio License yet? That's not a problem. TARA members can assist you in becoming licensed. All you need is a sincere desire. After you are licensed we will continue to help you achieve higher classes of your license. We will also show you what training is available for emergency services and how to obtain it. We will help you learn new modes of operation and vital communications skills. You can make a difference, and you can have fun doing it. For more information come to one of our meetings or email us. www.tippahara.org is the registered Internet domain name of the Tippah Amateur Radio Association - All Rights Reserved.